Wickets tumbled as firstly Broad and Anderson and secondly Gul and Rehman ripped through the batting. Ordinarily, dismissing your hosts for 99 after they won the toss would be cause for joy. But this was no ordinary day; it was a day that had observers reaching for their thesauruses trying to find both new superlatives and new curses. If this had been a County Championship match, the pitch inspectors would have been on the first available train, but their trip would have been in vain: there were no problems with this pitch, no exaggerated bounce or devilish spin. There was however some small movement for Stuart Broad, who continued riding his current wave of awesomeness in dismissing four batsmen cheaply. Movement in to the right-handers, aided by DRS, was the main cause; leg before wicket again being the prevalent form of dismissal. 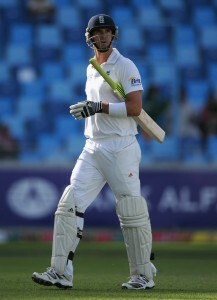 In truth, both he and Jimmy Anderson (3-35) bowled exceptionally and deserve immense credit. No team since 1905 have won a Test match after being bowled out in the first innings of the game for fewer than 100, and these two quick bowlers should have put their side on the path to victory. There is no sight that captures the hopeless panic and melancholic humour of an English batting collapse than a competent batsman walking off with his bat tucked under his arm like a blunt sword and his upturned helmet in hand like a beggar's cap. For the fifth consecutive innings, England’s batsmen failed. It is remarkable that there has not yet been a century for either side in this series, but just as remarkable is the sheer paucity of the contribution from the English middle order. They weren’t aided by an Alastair Cook swipe to Adnan Akmal, nor Jonathan Trott being out LBW to a ball that would have missed leg stump (on a day when referrals were common, mostly due to Simon Taufel having a dreadful day, it was surprising that he and Andrew Strauss chose not to review), but Ian Bell and Eoin Morgan continued their hellish run of scores. The former was completely at sea against Rehman (for 25 consecutive balls) and Ajmal (who had him stumped from his third delivery). To continue a nautical metaphor, Morgan was again further out of his depth than Ronnie Corbett swimming above the Mariana Trench. Yet in truth, for a short while, England looked okay; Strauss was less becalmed than usual and Kevin Pietersen appeared to play positively and with some exuberance. It was his dismissal that summed up the day though, and was the moment when panic began to set in once more. He had reached 32 from 44 balls when Rehman speared one in at his pads. Umpire Taufel gave him out; Pietersen referred the decision – to the sage nodding of heads confident that the ball would have continued past the stumps towards the fine leg boundary. Notwithstanding this sage head-nodding, the budget version of HawkEye thought differently and showed barely the raised quarter-seam tickling the easternmost electron of the stump. The heads began to shake, Pietersen threw – and caught – his bat, the heads were then held in place by hands, and Pietersen stomped off to the dressing rooms for a bunch of sour grapes. England were 64/3 and suddenly Pakistan were bouyant. The subsequent three wickets were a formality. Here Kevin Pietersen fails to remove helmet or gloves, but the immaculately-tucked bat and perplexed facial expression is another classic pose that is proudly English. Let’s not forget that England are ahead, nor that Pakistan have not exactly shone with the bat in this series either. England will hope that Broad and Swann can hit enough runs to take the lead up towards 70 or 80 (remember that someone from this website, who shall remain nameless for the time being, predicted a Swann century this series), but Pakistan equally will be confident in rattling through the last four wickets. Basically, who knows? No doubt, whatever happens, it will continue to be extraordinary.